If you are one that enjoys hunting for treasure and use an Android or iOS based device, then you might be using the Goecaching app we have previously reported on, a global treasure hunting game where hunters seek out hidden containers called geocaches. 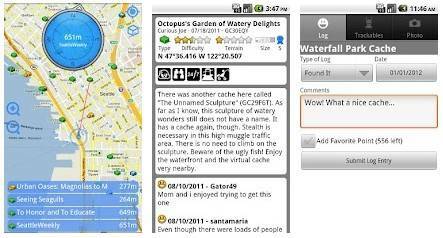 The Geocaching app uses a combination of WiFi positioning, cell towers and GPS to determine the rough location of players, and then queries in real time the Geocashing.com database to deliver a list of hidden geocaches near the player’s location and the players go off to see if they can find the hidden treasure. Well there is now a a rival mobile app to the Geocaching app called Neongeo, which is available for the Android platform that delivers a complete geocaching suite for online and offline use, and enables treasure hunters to search for geocaches whilst on the go or import GPX. Log trackables. The Neongeo app for Android offers secure access to geocaching.com, is powered by Geocaching Live, has custom map servers, thousands of geocaches in its memory, detailed geocaching listings, is very battery friendly, and offline supports means you can prepare maps and geocaches before setting out. Of course with the Neongeo app for Android you will require a premium Geocaching.com membership for the best experience, whilst basic members will receive up to three traditional geocaching listings a day. For those that would like to take advantage of what the Neongeo app for Android has to offer, you can download the app to your chosen device from Google Play at a cost of Â£2.64. So what we’d like to know from our Android toting readers is, have you downloaded the Neongeo app, and if so, which app do you prefer, Geocaching or Neongeo? Feel free to let us know by dropping us a line to our comments area below. I am using c:geo on Android, it’s great because it works fine even with basic membership, and it’s free. But will try this one, thanks. I also use C:geo!!! It works soo well, I feel there is no need to compare! I tried it–total waste of $4. Â No matter what I did, it always opened up with the same map of caches well away from where I was. Â I am not a computer genius, so need something simple to use, like c:geo. Â I never have a problem with that app. I downloaded the neongeo demo, and if there’s a “navigate/driving” function, I haven’t been able to find it. I would not spend $4.00 on this app. c:geo is free and provides a navigation function. I also prefer the look of the list view of caches in c:geo.